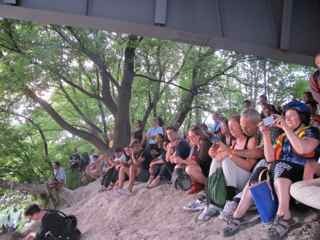 I would never consider sitting on the banks of the Don River in Toronto–let alone under a bridge. Crumbling concrete beams coated in graffiti, a shopping car or two: it just doesn’t feel, well, safe or cozy. Right or wrong, it’s not a place to linger, let alone be inspired. Or is it? Squished together on the soft sand with a mass of cyclists, everyone watches intently across the river: a supine man contorts and twists to strange undulating sounds. I contemplated his words as we got back on our bikes and headed off to the next installation: there really is nothing to ‘get’ –art isn’t a mathematical equation because there is no one answer, or feeling. I don’t quite ‘get’ the intent of the man writhing around in the mud either, but it’s enough to start a conversation about what art does move you and what speaks to you; however, he’s here and he’s perhaps a little more open to a new experience, even a little, then he was before. That’s enough. Artspin is a wholly Toronto event conceived by Rui Pimento, and Layne and Casey Hinton. And the idea is simple: to marry art and the bike community. http://www.artspin.ca It’s also a chance to get people to see art in unconventional settings. Today we met near a former industrial area of the city near Cherry Street. It’s my first time at Artspin and I really hope more than a few people show up–nothing worse than showing up and it’s you and one other person. Awkward city, non? I’m early so I have a beer at the nearby pub and watch as the parking lot fills up, and fills up. There’s got to be 50, no 100, no 200 or more riders here. What the hell is happening? I didn’t know that many people owned bikes in Toronto. Three hundred and fifty cyclists show up. Wow. Shamez Amlani (another organizer) announces that last year the city of Berlin copied Artpsin. How cool is that? Berlin thinks Toronto is worthy of mimicking? It’s so often the other way around. Toronto is cool damn it! Casey begins playing the trumpet, which he does throughout the ride; one hand on the bars and the other on the brass! And with that, we’re off! At first riders dominate the road–almost six riders wide. Everyone is moving carefully. “No one make any sudden moves,” I say. “God, this is the worst bike race I’ve even been in,” says the guy next to me. This really cracks me up. Ushers stop traffic as we make our way across streets and onto the Don Valley bike trail and head north of the city. 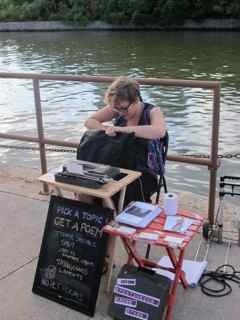 “This is different from most rides when we’re downtown — we’re almost single file then,” says Annalise- a sparkly top artist and singer and also a part time biking fixer with Pirate Bikes. The organization teaches people how to repair their own bikes. “Everyone park your bikes here,” announces another usher. We’re about to see our first installation. Bike volunteers watch our bikes as the crowd moves to a rusted bridge north of Queen. In the centre, five women stand facing the same direction. Eventually they sway, then one begins to move her arm as if she’s throwing a frisbee, the others follow; then, their heads move up and down. Next, they stop. Change direction and now they’re still. Eventually they are moving like a machine back and forth against one another. It’s never the same movements. By the end, red-faced, and sweating, the women are thrusting and jerking violently. Then, it stops. After the show, I speak to a dancer and the show’s choreographer about the piece called Multiforms: “I was interested in seeing if the body could be abstract–if watching something for a long time you could see something other than the human form,” says Amanda Acorn. Hoping back on, I start small drive-by conversations with riders. 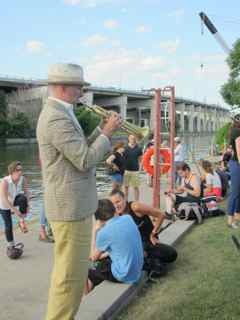 A mini band plays music beside the bridge. 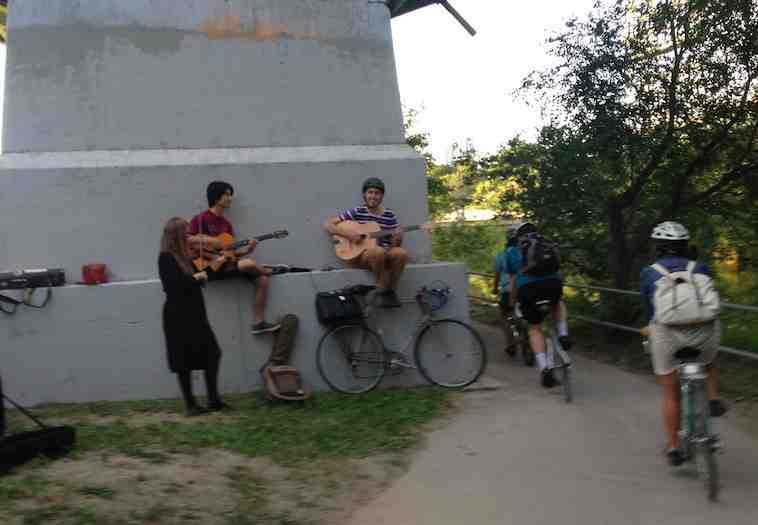 In the future, every time I ride by this place, I’ll remember those musicians; they’re playing so casually– as if hearing music on a bike path is the most natural thing in the world. We arrive at the second installation. 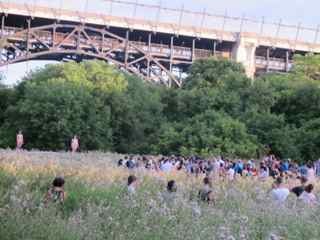 In a beautiful meadow, everyone congregates in front of a stage; a naked man and woman are facing us. The duo eventually turn to face one another, but during the time it takes me to bend down to scratch a mosquito bike, they’ve jumped off the stage. It’s over. Everyone claps. What the what? Kudos for standing naked in front of all of us, but I missed the point of that one. Maybe that was the point? Nakedness. God knows I was anxious showing my body to strangers on the islands. Back on the bikes, the sun is going down. 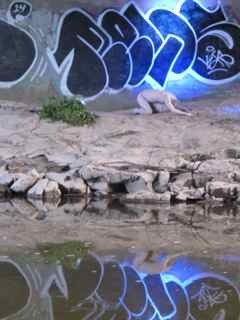 Bike lights illuminate the path of cracked pavement–somehow the eerie river shore isn’t so scary anymore. The third installation is the man in the mud. The fourth is located in Evergreen Brickworks, a former industrial complex now an incubator for green programs. Inside a dark concrete complex, we gather to see the projection of a horse on a screen. Artist/architects Mitch and Brad from Studio F-Minus http://studiofminus.com create giant public art installations and made this one for the city’s Nuit Blanche festival a while back. 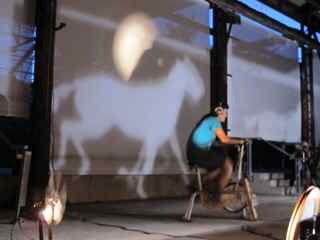 As someone pedals on the stationary bike, it moves three cut out silhouettes of horses against a giant projection screen–essentially once the wheels start moving you look like you’re riding on the back of the horse. But wait! While you’re riding, you wear headphones that play Phillip Glass classical music. I tried it out and in front of all the cyclists, the music puts you in your own headspace– everyone disappears as you ride the horse! Amazing. Leaving Brickworks, heading toward the finale, the ushers block off Bayview Avenue; we’re heading the wrong way on a notoriously fast and dangerous strip of north/south roadway. Bells jingle and dance music booms from a giant bike trailer — it’s a party on wheels. IMG_4097 Check out the par-tay. 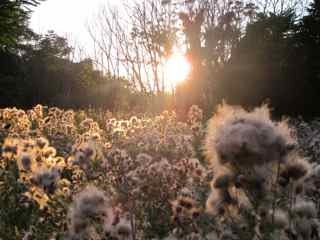 We’ve reached the end; turning off the concrete, we come to a wildflower meadow and what feels like an enchanted forest, like a beautiful outside wedding is about to take place. 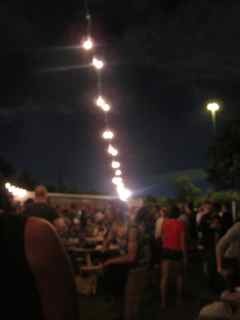 A band plays blue grass, while cyclists grab their beers and delectable smelling pork sausage buns to sit under delicate string lights. Heavenly. We’re at Todmorden Mills Heritage Site, another one of those natural gems in the middle of the city with a theatre, some historical homes and a wildflower garden. Biking home alone after a couple of dances on the grass, my legs switch to autopilot. Starting at 7PM, it’s now 12 PM. No strenuous riding, but my head is packed with thoughts of my Toronto. All these amazing things I’m exposed to and I didn’t have to get on a plane at all and run away to another country. Can you believe it? I can’t. This is all in my backyard and I love it.